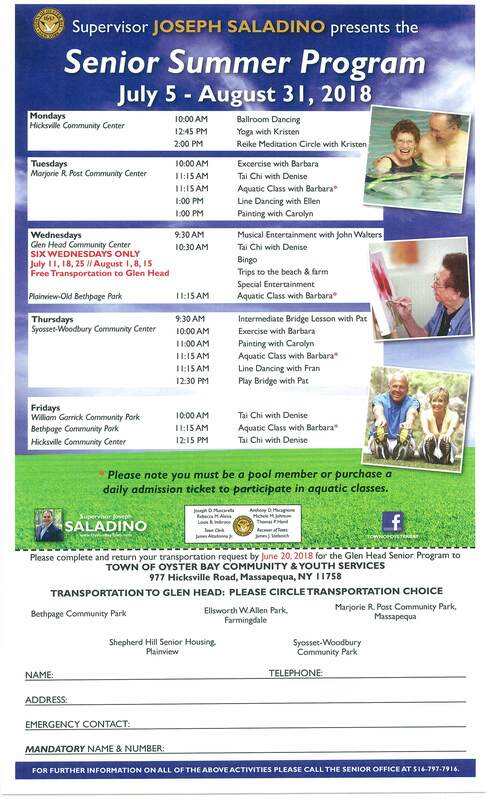 Oyster Bay Town Supervisor Joseph Saladino today announced a variety of free weekday senior citizens summer activities offered by the Department of Community and Youth Services (CYS) in community centers throughout the Town. Yoga, dance instruction, and aquatic classes are just some of the activities seniors can enjoy as part of this year’s program, which runs from July 5th to August 31st. Mondays at the Hicksville Community Center: 10am Ballroom Dancing; 12:45pm Yoga; and 2pm Reike Meditation Circle. 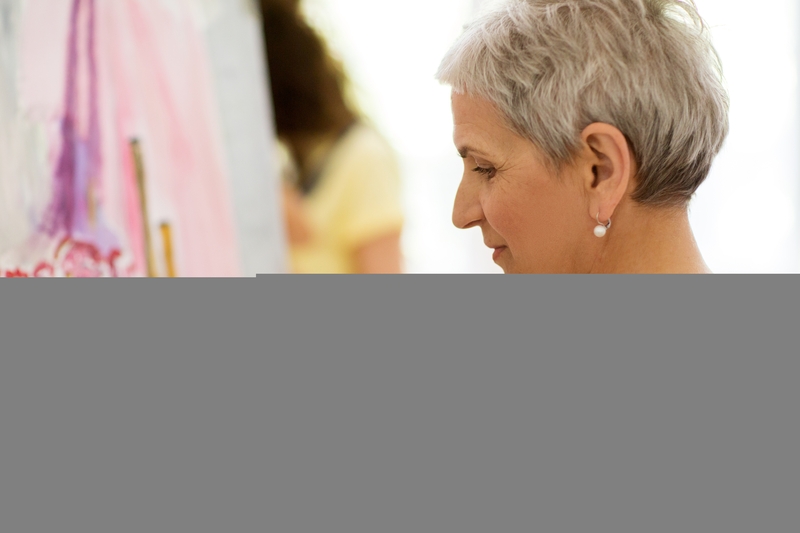 Tuesdays at Marjorie R. Post Community Center: 10am Exercise; 11:15am Tai Chi; 11:15am Aquatic Class; 1pm Line Dancing; and 1pm Painting. Wednesdays at Glen Head Community Center: 9:30am Musical Entertainment; 10:30am Tai Chi, Bingo. On six Wednesdays only, July 11, 18, 25, and August 1, 8 and 15, free transportation will be provided to the Glen Head Community Center from all other centers for Town seniors to enjoy the above-mentioned programs. As well as cards, exercise, rummikub, refreshments and more. Wednesdays at Plainview Old Bethpage Park: 11:15am Aquatic Class. 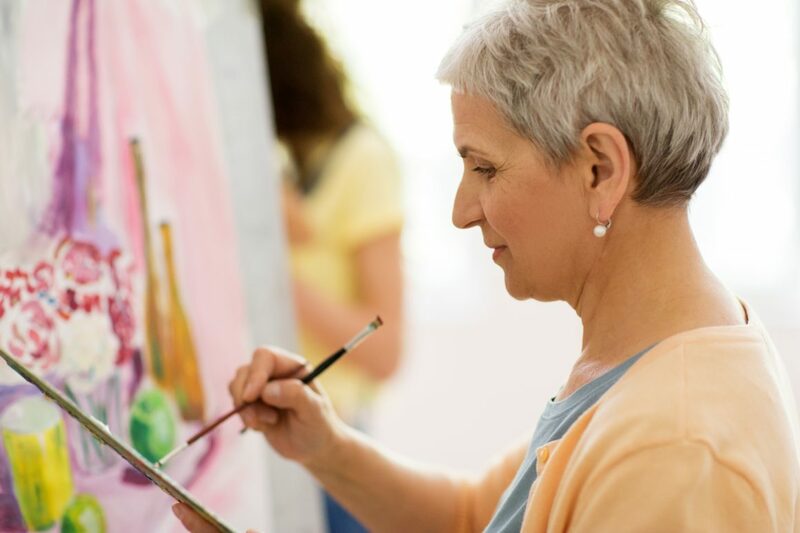 Thursdays at Syosset-Woodbury Community Center: 9:30am Bridge Lesson; 10am Exercise; 11am Painting; 11:15am Aquatic Class; 11:15am Line Dancing; and 12:30pm Play Bridge. Fridays at William Garrick Community Park: 10am Tai Chi. Fridays at Bethpage Community Park: 11:15am Aquatic Class. Fridays at Hicksville Community Center: 12:15pm Tai Chi. Please note that residents must be a pool member or purchase a daily admission ticket to participate in aquatic classes. For more information on these Senior Summer Activities, please call the Division of Senior Citizens Services at (516) 797-7916.